HELLO, WELCOME TO iHARVEST COWORKING SUNSHINE. Our mission is to be a space for local heroes aiming for global achievements. Our vision is to be a vibrant, inclusive and sustainable entrepreneurship community making a positive impact on society. Our four values shape our coworking spaces’ culture, who we accept into the space and why we do it. iHarvest is a family. We welcome new people. We are friendly and respect our differences. We create purposeful connections, collaborate and grow together. Our premises are designed to facilitate productivity. We work hard. We get things done. Then repeat. We exchange knowledge and lessons learnt. Our program of events, workshops and networking helps us find business partners, customers, friends, mentors, or simply a different perspective. Once home of McKay’s Sunshine Harvester Works, Sunshine is again a thriving place for entrepreneurs in the premises of iHarvest Coworking Sunshine – where individuals aspire big and do not give up. iHarvest Coworking Sunshine has an excellent location that is second to none and the great food and cultural diversity of the area is at our doorstep. The Sunshine Railway Station is a ten-minute walk away with VLine and Metro services from Melbourne CBD, Geelong, Ballarat and Bendigo via the Sunbury line. Click here to visit Public Transport Victoria website. Ample car parking is available in and around the town centre. View the Sunshine town centre carparking map here. Bike parking stations are available around the town centre. View the Travel Smart Map here. 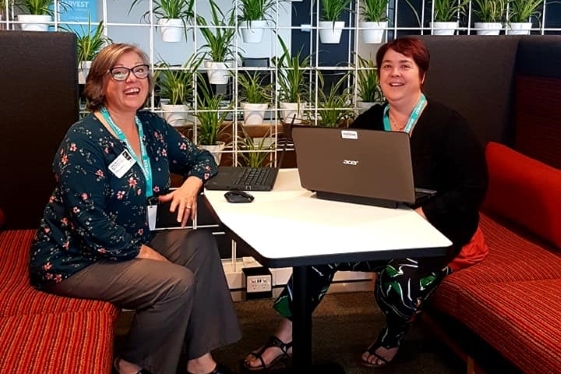 iHarvest Coworking Sunshine is an initiative of Brimbank City Council providing a vibrant and affordable coworking location for startups, entrepreneurs, freelancers and business in the heart of Melbourne’s west.